After many years of service in the Highgate community, we feel confident that we can cater to your needs. We specialize in smoked meats. We have a variety of products for you to choose from. Take a look see! Take a look at some of our prime cuts and special products. Proudly serving the community since 1977. 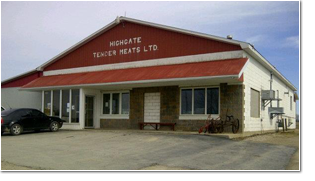 Family owned and operated butcher shop offering custom butchering of poultry, beef, hogs, lambs and goats and retail meat counter filled with homemade smoked meats and dry aged farm raised beef and pork. During the months of June to Dec look for fresh chicken, duck,turkey and rabbit. Our company offers not only beef, hog and lamb processing service, we offer poultry and rabbit custom killing. We take pride in making homemade smoked meats such as our award winning black forest ham and champion beef jerky. Our products are made fresh and smoked daily, every meat product that is made at our facility is spiced and smoked on site. Delivering the freshness our customers deserve. We offer our own family farm raised beef with no antibiotics or hormones .Our beef is aged for 3 weeks giving it the tenderness and flavor, we know our customers love. We offer half's quarters and whole beef for sale. For the BBQ lovers come in and have steak cut and wrapped the way you want. People are happy to know where there beef is coming from. Your satisfaction is guaranteed.